The Decemberists released their 8th studio album, I’m Your Girl in March. The band went towards a new direction, going with John Congleton as their producer. The album was a less typical Decemberist sound, adding synthesizers and political undertones. The band recorded songs for the album and singer Colin Meloy said what was included was the “usable” tracks. This means that their EP, Traveling On, which include only outtakes from the recording, contains the unusable tracks. However, the 5 tracks on the EP are usable, they’re just not exceptional. Meloy sings in “Midlist Author:” “You’re never the best but you’re never the worst” a statement that this EP essentially embodies. “Down On The Knuckle” is the upbeat opener to Traveling On. The lyrics are ridiculous: “A life spent all indoors/ Well, isn’t that what doors are for?” I really don’t think so. Meloy sings the word “knuckle” stretching the last syllable in a way that makes it irritating to listen to. Considering that every chorus and verse ends with the word, it makes the song hard to enjoy. The transition between “Down On The Knuckle” and “I Will Not Say Your Name” is odd–The fast paced opener leads to this slow, dark ballad. Despite the rocky change in pace, the song performs well. In their last album, The Decemberist got political (the music video for “Severed” portrayed a caricature of Trump as an orange faced devil). So, It’s no surprise that an outtake is also political. “I will not say your name/ Go back from where you came/ Hope you enjoy your stay/ We will not go away.” This is Meloy’s version of the Not My President mindset. Slow, low, bass behind Meloy’s angry words fit the scene. “Your time’s gonna come/ And when it comes…/Oh, what a happy day.” I almost can hear the sound of the fire that the band is probably burning Trump’s photographs in. The nearly six and a half minute long track ends in a long, dark instrumental. sticky sticky sticky and sweet”), the livelier renewal was enjoyable. Perhaps the best track on the EP is “Midlist Author.” The song, which opens with optimistic piano, describes a devestangily average author: “Address your letters to/ Midlist author/ You’re never the best but you’re never the worst.” It’s hard not to think this is an autobiographical song, considering Meloy recently published his fourth children’s book. Meloy comes from a family of writers; his sister Mail and aunt Ellen are both award winning authors. In comparison, it’s possible Meloy sees himself as a midlist author. 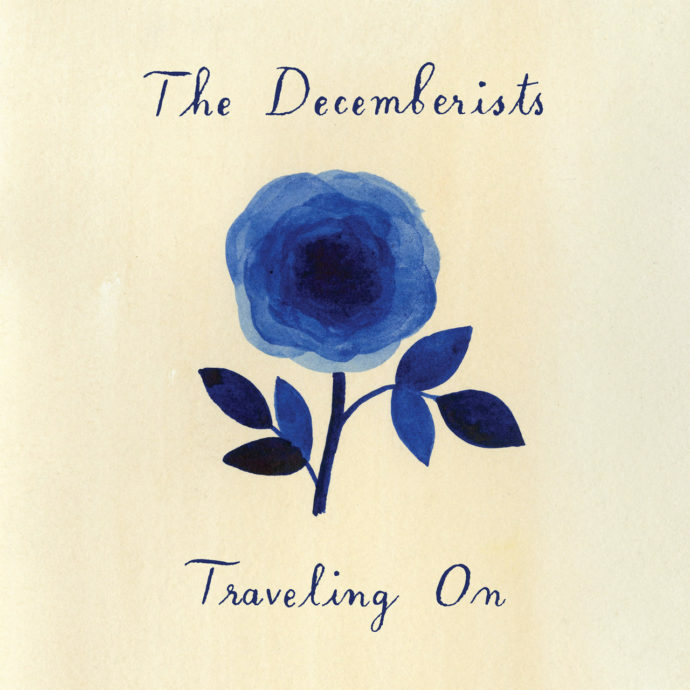 The EP ends with the track “Traveling On,” fully embracing the Decemberist sound so much so that one can’t help but wonder whether they’ve heard the song before. Gloomily, Meloy sings “Sold for a song/ We’re traveling on/ And it won’t be long/ ‘Til We’re traveling on.” Bands often find touring exhausting, but it sounds like there is nothing Meloy hates more: “Fawning fanfare/ Nearly nowhere… No one knows you/Nations loathe you/ Please let me know when I can rescue myself if I choose.” Meloy sounds so sad that he convinced me maybe The Decemberist need some rest.